Posted in This Week in Social and tagged with This Week in Social, Digital, Social Media, Marketing, Advertising, News, Twitter, Facebook, Voice, Music, Amazon, Spotify, Apple Music, Hulu, AT&T, Watch, Messenger, Instagram, Google, Pinterest. April 21, 2019 by Taylor Wiegert. 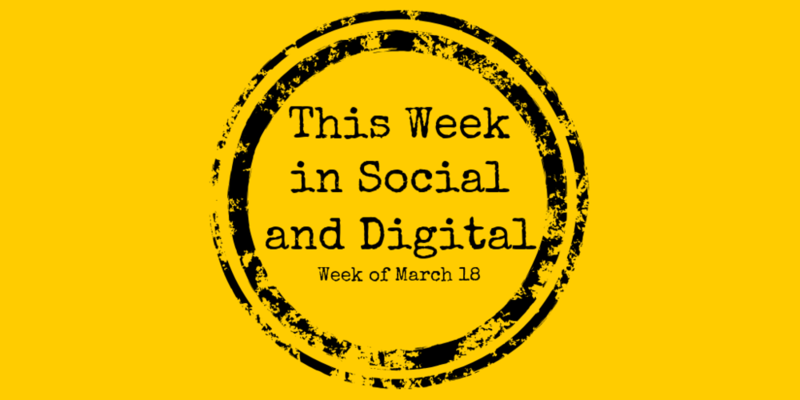 This Week: The Uncertain Future of Empathy, Facial Recognition’s Outrunning Laws, Managing the Chaos that is YouTube, Mismanaging Hell and The Best Way to Be Cool is Not Trying. Posted in This Week in Social and tagged with This Week in Social, Empathy, Facial Recognition, YouTube, Facebook, New York Times, Wired, Champion. April 20, 2019 by Taylor Wiegert. Posted in This Week in Social and tagged with This Week in Social, Social Media, Digital, Marketing, Advertising, News, Facebook, Twitter, YouTube, YouTube Stories, Twttr, Project OAR, COPPA, Potential Reach, Apple, Watch Party, Apotify. March 17, 2019 by Taylor Wiegert.